How One Man Played 'Moneyball' With 'Jeopardy!' Roger Craig has wanted to be on Jeopardy! since he was 12 years old. When he finally got his shot, he knew he had to make it count. So he built a computer model to mine Jeopardy! for patterns. He says the most exciting part wasn't the money — it was that his system worked. One night last September, Roger Craig, a computer scientist from Newark, Del., was about to make history. 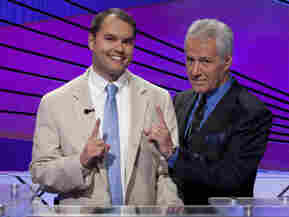 In his second appearance on Jeopardy!, he'd given one of the most dominant performances ever seen on the show. "The whole game was sort of like a flow type of experience," Craig tells weekends on All Things Considered guest host Laura Sullivan. "I was in the zone." When it was time for "Final Jeopardy" — the last and most important wager of the game — Craig's competitor Tony Fan turned to him. "Dude, I think you can break the record," he told Craig. Craig looked up at the scoreboard. He had $47,000. The money record for a single game, set by Jeopardy! legend Ken Jennings, was $75,000. Craig turned to Fan and said, "I think you're right." Craig, who holds a doctorate in computer science, broke that single-game record last September. He went on to win three more games — a total of five. That night, he sat in his hotel, stunned. "It wasn't even about the money," he says. "I felt that my systems and my methods were sort of validated." That system? A computer program unlike any other, custom-built to study Jeopardy! for patterns. Roger Craig - Knowledge Tracking from Steven Dean on Vimeo. Craig says it works like Moneyball — a reference to the book and movie about the statistical techniques used by legendary Oakland Athletics coach Billy Beane to build a winning baseball team. Craig's system also relied heavily on statistics. "I actually downloaded this site called the Jeopardy! Archive, which is a fan-created site of all the questions and answers that are on the show." "Something like 211,000 questions and answers that have appeared on Jeopardy!," says Esquire writer Chris Jones, a self-proclaimed "game-show nerd" who's familiar with Craig's tactics. Using data-mining and text-clustering techniques, Craig grouped questions by category to figure out which topics were statistically common — and which weren't. "Obviously it's impossible to know everything," Jones says. "So he was trying to decide: What things did he need to know? He prepared himself in a way that I think is probably more rigorous than any other contestant." Once he'd calculated the odds a category would come up, Craig quizzed himself on a variety of questions to find the gaps in his own knowledge. But Craig says it's a fallacy for game-show candidates to think they need to know everything. "They want to learn every capital of every county in the world. And you really don't need to," he says. "Instead, you need to know the 80 percent people have heard of." That's because the show, he says, isn't written for the contestants. It's written for the people playing along at home, who need to feel they have a fighting chance to keep up. Craig says that means one simple thing for the player: "You don't have to outrun the bear. You just have to outrun the other guy." Craig wasn't done making big bets after he set the single-day winnings record last September. He'd earned a spot on the show's Tournament of Champions, which aired this past week. If he needed a second chance to prove his method worked, this was it. Roger Craig's Double Daily Double on Jeopardy! But the Tournament of Champion represented a new challenge. Craig was playing against some of the biggest, most-brilliant winners of the year. "I've written a lot about sports," says Jones of Esquire. "It's totally stripped me of any delusion I could be an athlete. And watching these guys play Jeopardy! is the same way." And yet it was clear from Game 1 of the semi-finals that Craig's system gave him an edge. After hitting one Daily Double and aggressively hunting for — and winning big on — the second one, Jones says Craig could have taken a nap. "At that point, he could have put his buzzer down and not played again and probably won," Jones says. "He just destroyed the game." Craig won $250,000 in the Tournament of Champions. He later told his fellow Tournament of Champion contestants about his system. One playfully ribbed him for cheating. Craig is quick to attack anyone who levels the accusation seriously. "Everybody that wants to succeed at a game is going to practice at the game," he says. "You can practice haphazardly, or you can practice efficiently. And that's what I did."